We’re committed to providing the best in live music as well as the best in recorded music. 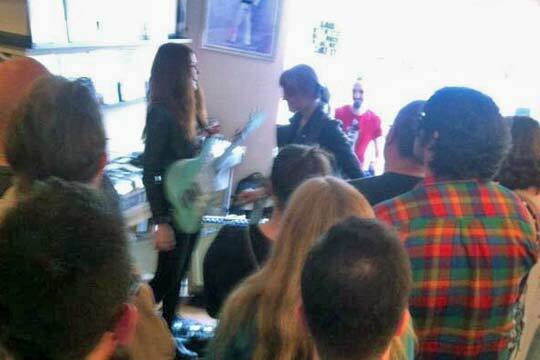 So we put on regular events with live in-store performances from great artists, signings and other exciting events. Keep checking back, or get on our mailing list to keep informed! 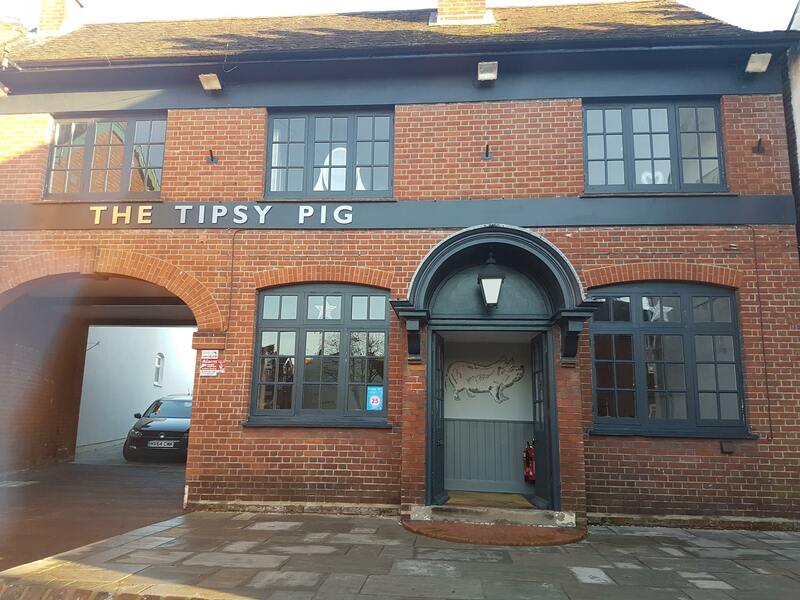 Our monthly music quiz takes place on the first Thursday of each month, hosted by our good friends at The Tipsy Pig in Latimer Street, Romsey. The next quiz will be on Thursday 2 May. The quiz starts at 7:30pm and max team size is 6 people. You’ll need a team as the 80 questions will cover all genres, and some questions (but not all) will be difficult. Entry is £1 per person, and there will be prizes of beer tokens and money-off vouchers, with all proceeds going to charity. Look forward to seeing you there! We are delighted to be the very first stop on Honeyblood’s short in-store tour to launch their new album, In Plain Sight. The Edinburgh duo will be singing and signing live in Hundred Records at 6.30pm. The album will be released on 24 May, and we will have early copies of the CD and exclusive dark-green vinyl available on the night. Pre-order here to guarantee entry. 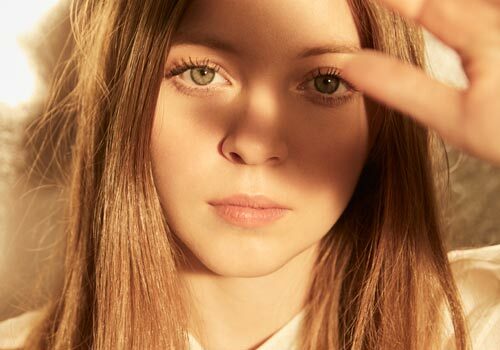 The latest in our stellar line-up of instores is Jade Bird, whose debut album is released on 19 April. She celebrates by coming to Hundred Records on Saturday 20 April to provide some lunchtime delight. If you don’t already know her music, check out her latest video. 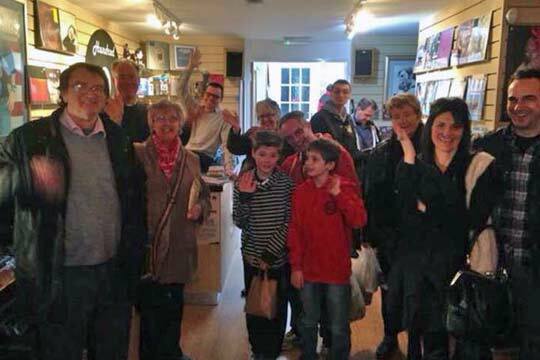 Yes, the amazing Record Store Day is back again! Click here to find out more. Thanks so much to Marry Waterson & Emily Barker for a beautiful and beguiling set. They performed selections from A Window To Other Ways, a fabulous album full of fly-on-the-wall observations of the contradictions and disconnections of modern life. 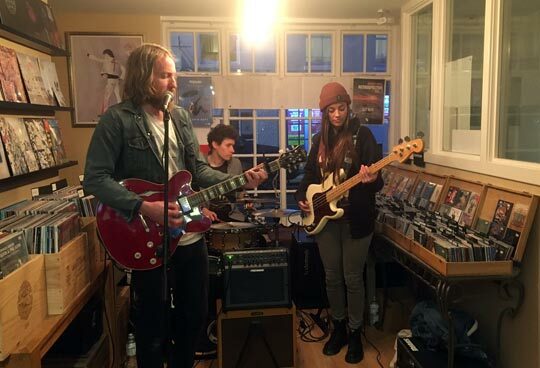 Our first in-store of the year saw us welcome William The Conqueror to promote their second album, Bleeding On The Soundtrack. We are unbelievably excited to announce that indie rock elite Razorlight – yep, this is not a drill, we really mean Razorlight! – will be live in-store, performing selections from their new album, Olympus Sleeping, which is out the day before. 1:00 pm – Alite will give us a sneak preview of their long-awaited debut. 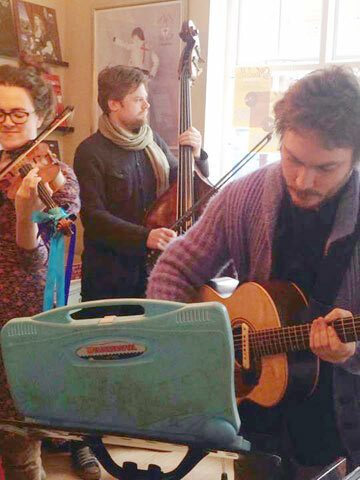 Come along and check out the sun-drenched west-coast harmonies this trio conjure up. 2:00 pm – Head South By Weaving, who are psych-folk at is very finest. 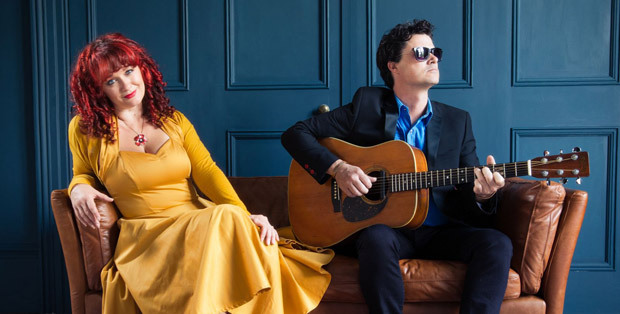 We are delighted to welcome back two-time winners of BBC Folk Duo of the Year Kathryn Roberts & Sean Lakeman whose new album, Personae, is due soon. So set your diary for a folk masterclass! Bennett Wilson Poole will be playing live in store at 1pm to promote their self-titled debut album. “Who?” you may reasonably ask. Well, Bennett is Robin Bennett of Oxford’s finest, The Dreaming Spires, and Wilson is Danny Wilson of the amazing Danny & the Champions of the World. In no way bringing up the rear is Tony Poole, producer extraordinaire and king of the 12-string Rickenbacker. Their new album has been described as “an assured, cohesive and above all, thoroughly accomplished musical delight of the highest quality”. For a full review of the album, click here. The wonderful Turin Brakes played to a packed house to promote their new album, Invisible Empire. They were fantastic! See some more great photos of the event here. Photo courtesy of Aidan Hampson. We are delighted and excited to announce that on Saturday 28th October we will have Patrick Duff playing at Hundred Records. For those of you who don’t know of him, see him here. Patrick will be here at 2.30 pm – don’t miss him!! We are really excited that Southampton-born singer Seán McGowan will be appearing in-store on Tuesday 12th September at 6pm as he is releasing a brand-new EP, Graft & Grief, on silver vinyl and CD. The 7-track EP features the singles ‘No Show’, ‘Apple Core’ and ‘Costa Del Solution’. Graft & Grief showcases Seán’s lyrical dexterity, knack for penning a catchy melody and laser-sharp social commentary. ‘No Show’ puts zero-hour-contract, minimum-wage drudgery into riotous perspective – rebellion in half-arsed job performance, revenge in furiously-paced folk-punk. ‘Apple Core’ draws gentle echoed gallops while Seán spits lyrics at a pace, a rowdy chorus nailing his unexpected eloquence. ‘Dog Tag’ flows from chin-up confidence to raw honesty, and ‘Clear Conscience’ rumbles with drum rolls under soft guitars. Finally, new song ‘Costa Del Solution’ is a bright, sunny jangle set upon high-street despondency, which twists the cliché of a beach holiday escape. 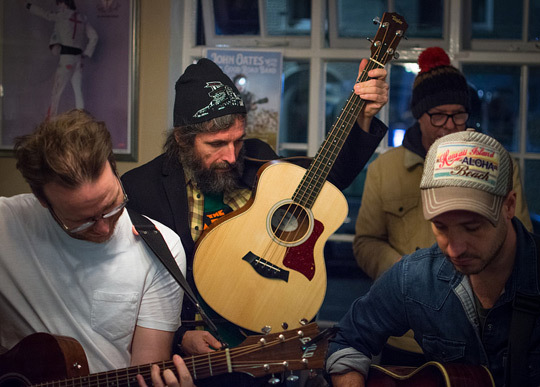 Graft & Grief is an impressive showcase for Seán’s rollicking full-band set of socially spot-on songs; an insight into realities of being young and musically motivated in modern England. You can pre-order the Graft & Grief EP here. We are delighted and excited to announce that we have Flyte playing in-store at 6pm on 25 August, the release date of their debut album with Island Records. You’ll hear influences that run from Nick Drake to Mac DeMarco by way of the Blade Runner soundtrack but always, always with their trademark vocal harmonies front and centre. Check out their single ‘Cathy Come Home’ to give you a taste of their sound. ‘How much will this cost?’ I hear you ask – well, it’s free! so come along on and be in on the ground floor of something special. We’ve booked a busy afternoon with a great line-up. 2:00 pm – Head South By Weaving. Prog-folk at its finest. 2:40 pm – Kinesis 4. Rock, prog, blues, harmonies and world music. 3:20 pm – Nick Tann Trio. Hampshire-based jazz trio. 4:00 pm – A Formal Horse. Full-on prog rock in the finest traditions of the genre. Hattie Briggs played at Hundred Pecords at 3pm on Saturday 10th June. We last saw Hattie supporting Sean Lakeman & Kathryn Roberts. Get a taste of her work here. Emily Barker gave us a truly special performance to promote her new album Sweet Kind Of Blue. Check out her songs Sunrise and Over My Shoulder, then make sure you’re here on 3rd June. 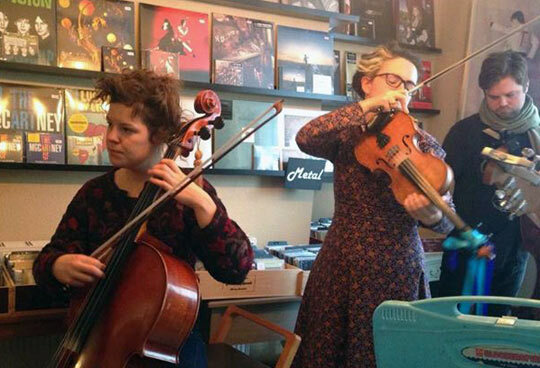 Hundred Records favourites A Formal Horse return to the shop to launch their new EP with a very special in-store. There will be a box set, raffles, all sorts basically, so come and see the mighty Horse! Come and hear Tom Martin play tracks from his new EP, Next Plane Out. Hear Tom playing here. We had a busy afternoon with a great line-up and loads of happy punters! Alite. Think Eagles country rock complete with 3-part harmonies. Head South By Weaving. Prog-folk at its finest. A Formal Horse. Full-on prog rock in the finest traditions of the genre. A Diamond Age. Fresh from appearing at Blissfields and before appearing at Victorius, A Diamond Age will display their dream-pop/shoegaze fusion. 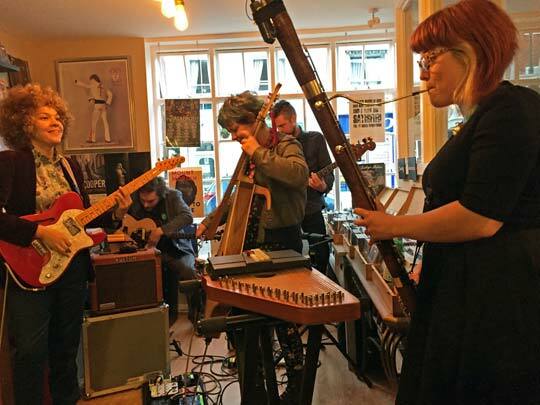 Hundred Records favourites Moulettes returned to Romsey and played an absolute belter of a launch show for their new album, Preternatural, in the shop. Check out our blog for pics and a review of the evening. 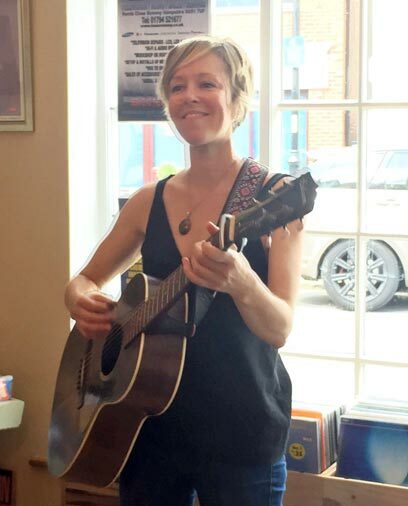 The fabulous Diana Jones entertained us on Record Store Day! The phrase ‘award-winning’ barely does justice to this native of New York and Nashville. Visit her website and begin a journey into the heart of American music. 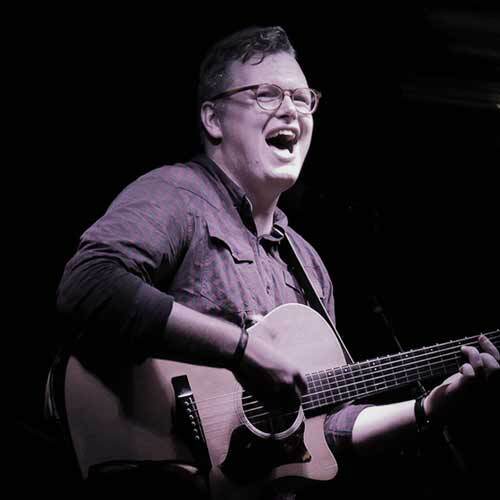 Two fabulous local singer-songwriters, Jim Chorley and Nick Tann, will be performing for us. 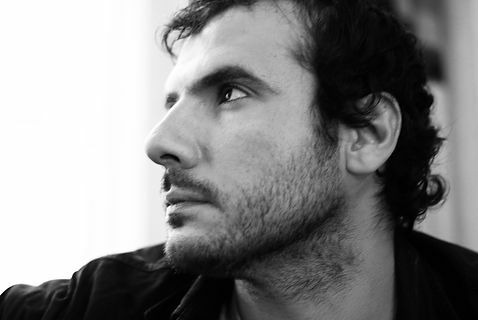 Italian-born London singer-songwriter Franc Cinelli brings his UK Folk Award-winning music to Romsey. Award-winning folk band Breabach are coming to Hundred Records just one day after the release of their new album, Astar! Ray was a mainstay of folk legends Oysterband. Check Ray’s website for more details. Great sounds from this talented emerging local artist. Check out his Facebook page. 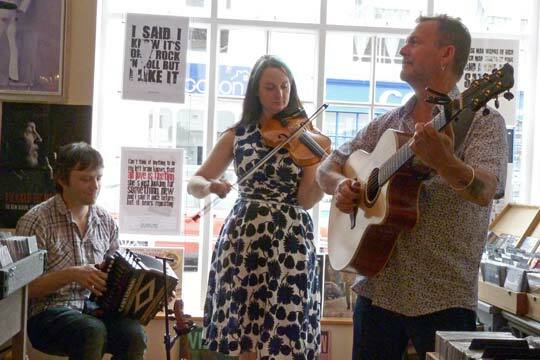 Trio featuring Martin Simpson (23-time BBC Radio 2 Folk Award nominee), accordion maestro Andy Cutting and BBC Radio 2 Folk Singer of the year Nancy Kerr. They stopped by at lunchtime during their tour in support of their latest release, Murmurs, and gave us a display of musical brilliance. Find out more on their Facebook page or at Martin Simpson’s website. American roots rock duo Larkin Poe took a break from supporting Elvis Costello on his UK tour to rock a packed Hundred Records with a raucous set! There are more photos from the event on our blog. 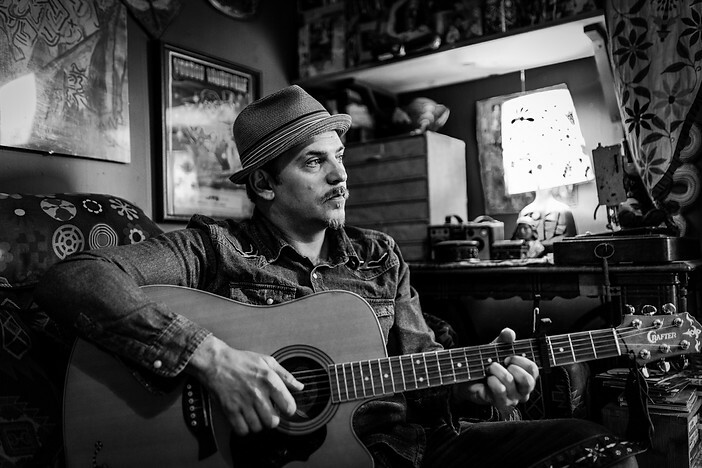 We were mighty pleased – no, wildly excited – to welcome Danny George Wilson of Danny & The Champions of the World to launch their new album, What Kind of Love, with an exclusive in-store performance. The highly regarded folk duo Kathryn Roberts & Sean Lakeman (yes, he’s Seth Lakeman’s brother!) 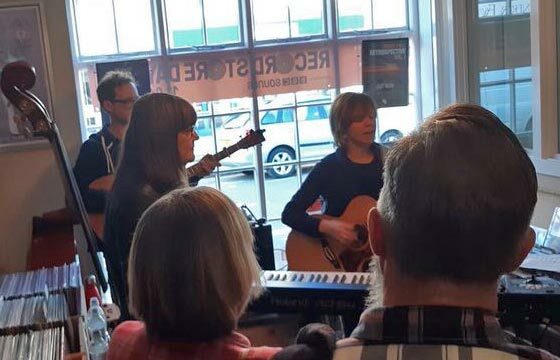 performed in-store to promote their new album. Album launch show from Kinesis 4 with A Formal Horse. The legendary Sid Griffin & The Coal Porters performed live and drew quite a crowd! 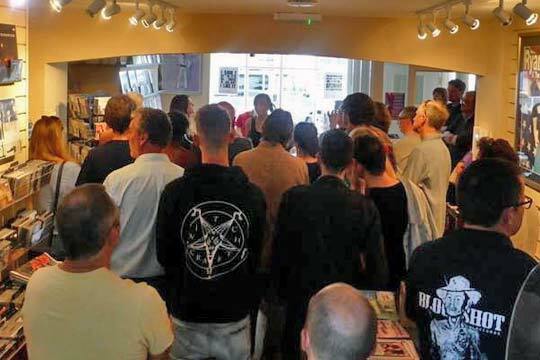 To celebrate the opening of Hampshire’s newest record shop, Graham Jones brought his live ‘Last Shop Standing’ event to Hundred Records. His comic tales gathered from the record shops of the UK produced plenty of laughs, as he revealed the dodgy shenanigans the record companies got up to trying to hype their records up the chart. Local folk duo Lantern Brigade kicked off the afternoon, and there was a short pop quiz with fantastic prizes. 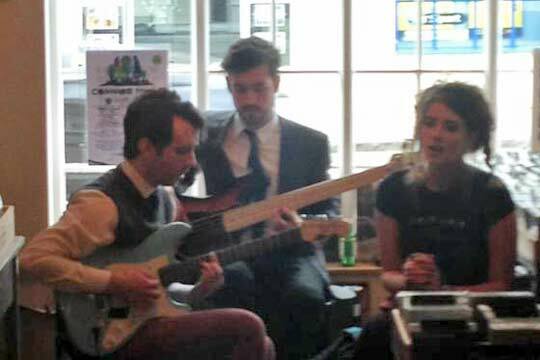 Moulettes performed a fantastic set at our first live event, and charmed everyone!